We’re big fans of The Bachelorette’s and for obvious reasons. She's the 'Bachelor Nation' fan favorite who has always been refreshingly candid and is essentially the most relatable Bachelorette the series has seen in its 13 seasons. Plus, Kaitlyn has a fun and playful sense of style that eschews the typical—which we, as designers, sometimes find hard to come by but, of course, adore in her. So, it's no surprise that we were thrilled when Kaitlyn and fiancé (the handsome contestant who won over Kaitlyn’s heart on season 11) reached out to us for design help. 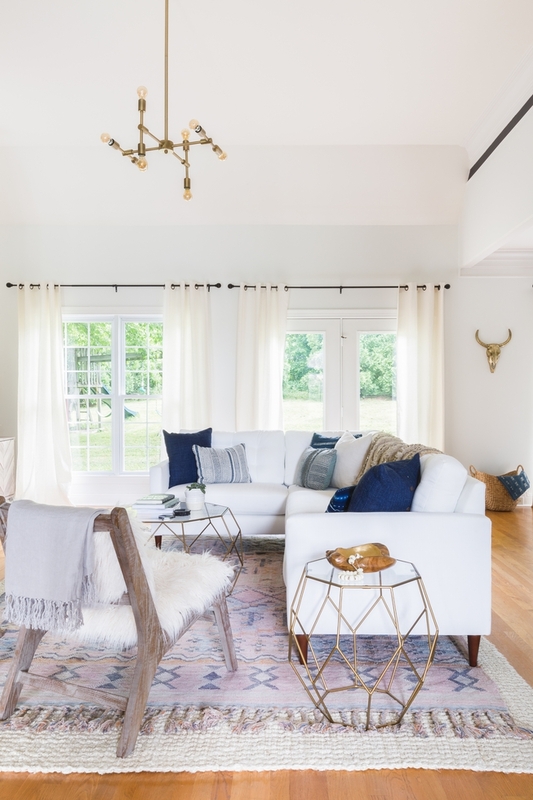 While enjoying their post-Bachelorette engagement, the couple moved into a new home in music capital Nashville, Tennessee. 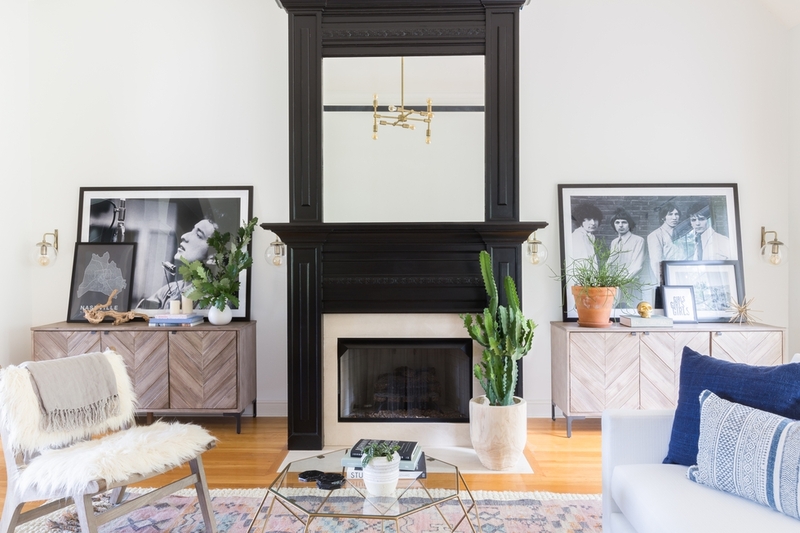 With busy schedules and a blank slate to decorate, Kaitlyn and Shawn asked Decorist, in partnership with, to transform their living room and dining room into an ultra-stylish bohème retreat. 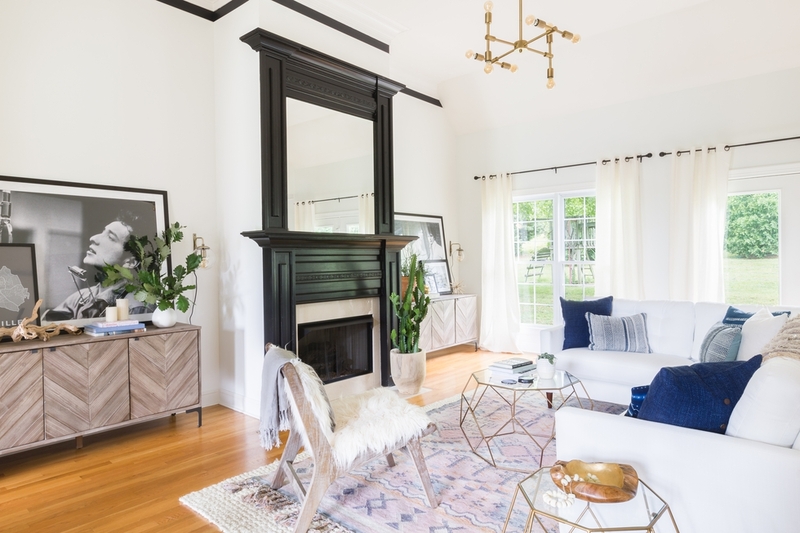 Decorist Design Director Jessica McCarthy worked closely with Kaitlyn and Shawn to design—100% virtually—their Nashville home into a perfect blend of feminine and masculine design styles, the results are gorgeous and uniquely theirs. “Inspired by the music capital, the design combines a bit of that laid-back bohemian style with a classic rock n’ roll vibe,” Jessica tells us. "It’s a little bit country and a little bit rock and roll!" Read on to learn more about the behind-the-scenes design and see their beautiful new love nest. Also, you can see more at or by picking up the September 11th issue of on newsstands now! While mixing styles can be tricky, Jessica's design seamlessly combined Kaitlyn's romantic and feminine style with Shawn's more edgy, masculine rock n’ roll look. Deep, dark, dramatic paint color helps to balance brass and more delicate details. Music-inspired décor is featured throughout both rooms—rock n’ roll accessories are combined with textural bohemian rugs, soft shades of blush and glamorous touches of brass and metallic. Jessica paid attention to the purpose of each space. 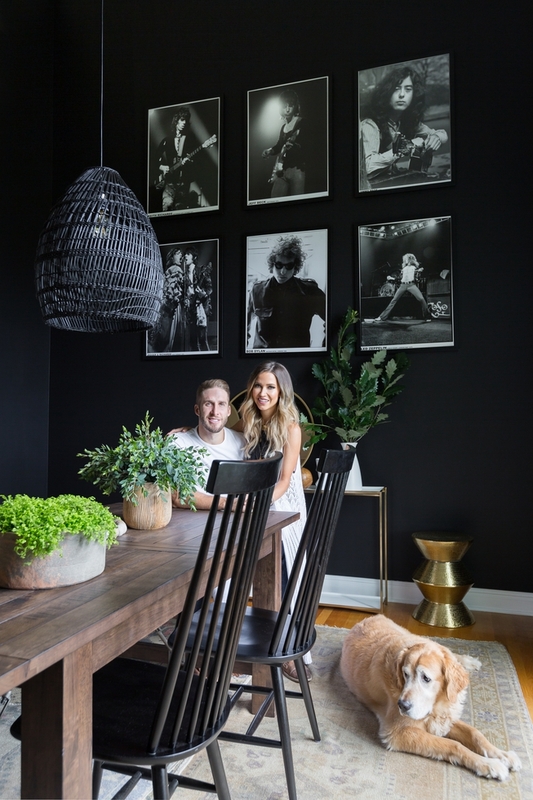 The dining room, which serves as a space mainly for entertaining guests and throwing dinner parties, features dark charcoal walls — Tricorn Black by Sherwin Williams — with a rock n’ roll art gallery honoring some of music’s greatest legends. To playoff the farmhouse vibe, Jessica chose a rustic wood dining table and bench along with the high back black Windsor chairs. “Layered vintage rugs, sheepskin, a brass bar cart and a black woven pendant create the moodiness of a recording studio,” she says. The adjacent living room is a place where Kaitlyn and Shawn can simply unwind or entertain their friends and family. Jessica recommended painting the original beige walls a fresh crisp white but maintaining the black trim which adds that edginess and drama to the room. The oversized white linen sectional, the brass modular pendant, the woven texture of a kilim rug and the cozy flokati chair help create a warm and welcoming atmosphere. Kaitlyn and Shawn’s love of Nashville gave Jessica the opportunity to pull in some fun art and accessories. “Vintage pieces from etsy and Nashville artisans throughout the space create a beautiful juxtaposition of old and new, a reflection of Nashville's culture,” says Jessica. 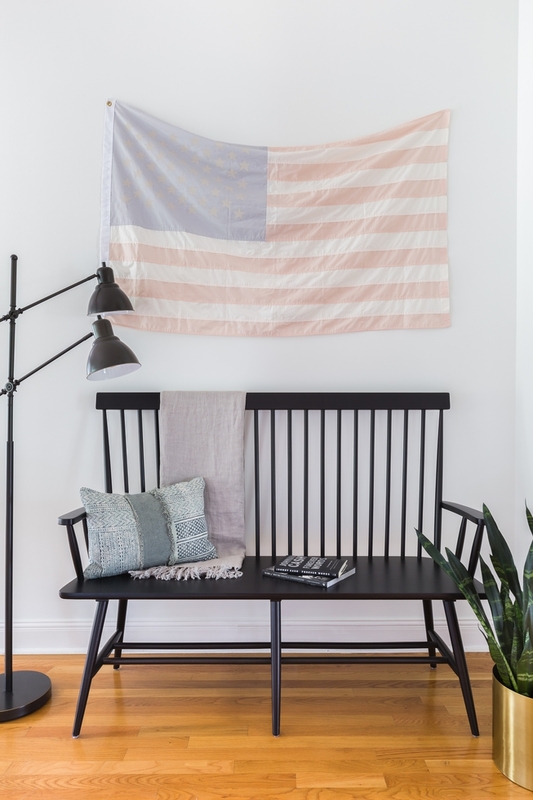 Jessica added a dose of Americana to the design with a vintage American flag hung over the black Windsor bench. Of course, for Canadian born Kaitlyn this was on of those design disagreements she had with Shawn who loved the idea of an American flag and a bit of patriotism in the house. "I did really like it," says Kaitlyn, "But I was like, then we have to put a Canadian one up somewhere too." The small dining nook has a modern boho-vibe and serves as a more casual space to eat or a great place to work, offering a cozy contrast to the dining room with the wood and white metal tulip table, white Eames-inspired seating, feathered brass pendent and a bohemian macrame wall hanging. Feeling inspired and want your own chic farmhouse look? Start a today to transform your home into a bohème retreat. It's a simple and affordable way to make your home look beautiful and feel uniquely yours.